Along with my Trossfrau/Swiss Dress I need an appropriate hemd(chemise). 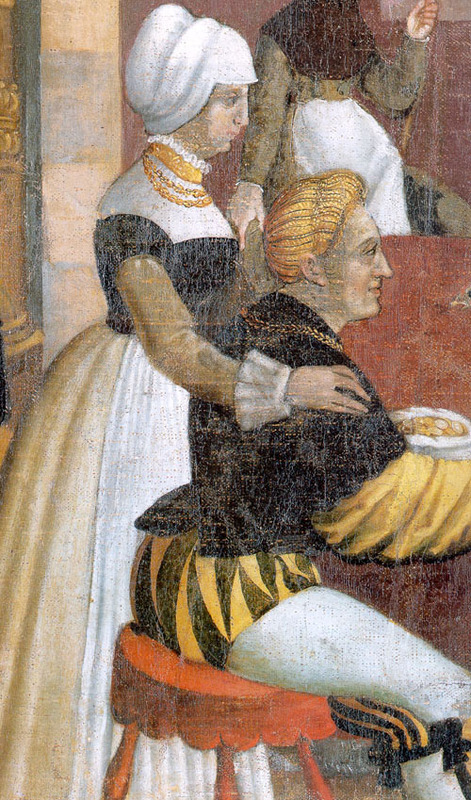 Detail Woman and Knaves The German single-leaf woodcut, 1500-1550, Max Geisberg ; rev. and edited by Walter L. Strauss, New York : Hacker Art Books, 1974. Edhard Schoen G.1235-1238. 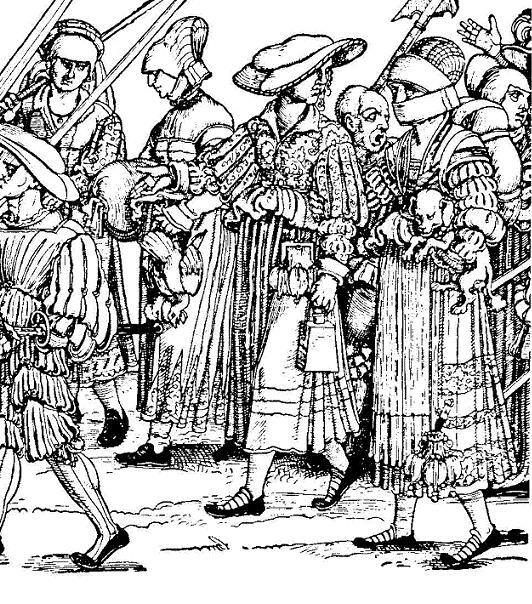 Detail – Army Train 1532 The German single-leaf woodcut, 1500-1550, Max Geisberg ; rev. and edited by Walter L. Strauss, New York : Hacker Art Books, 1974. 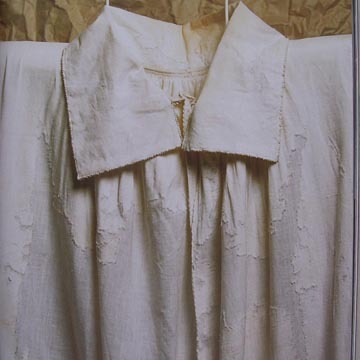 One of three linen shirts found in the Shipwreck of the Gagiana. 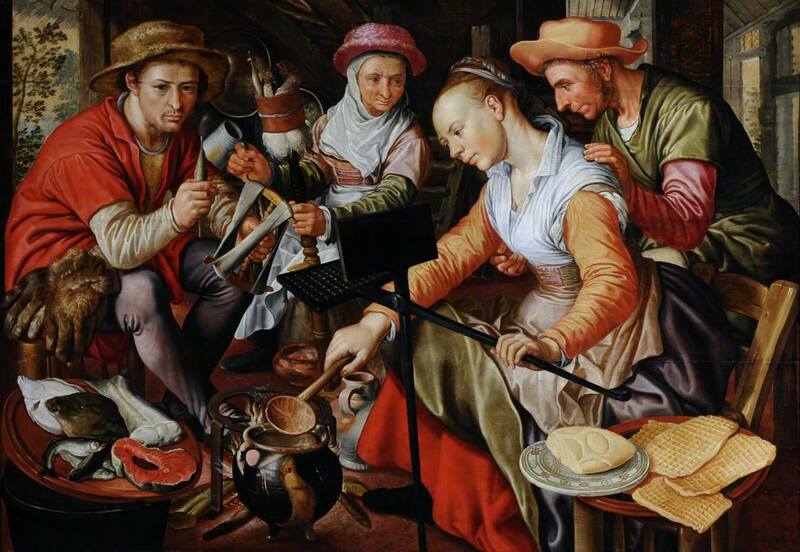 Flury-Lemberg, Mechthild; Textile Conservation and Research; Abegg-Stifting Bern; Berlin; 1988. 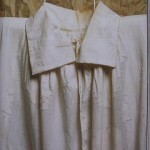 One of three linen shirts found in the Shipwreck of the Gagiana. 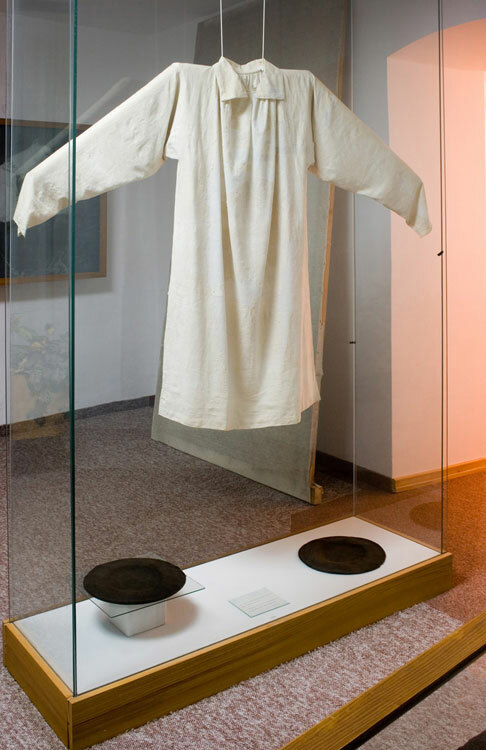 Possibly in the Municipal Museum of Biograd. Picture found on Landsknecht.org site. 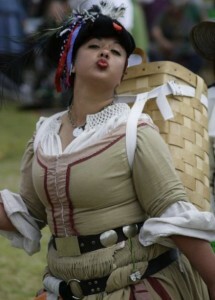 I love the smocked neck. There are several acceptable styles(high neck, low neck, rounded neck, etc). I’ve decided I like a high-necked front-opening hemd with honey-comb smocking at the neck. When I made the shirt for Fearghus’ Waffenrock I used a pattern very similar to one suggested by Rainillt in the Pleatworks Yahoo! group. It worked well enough but I notice that it has a tendancy to slide and lie flat on his shoulders. I want to try and avoid this so I’ve update the cutting pattern somewhat. Starting to pleat the neckline. Gather stitches are in red (will be removed), honeycomb pleats started on the right-hand side. 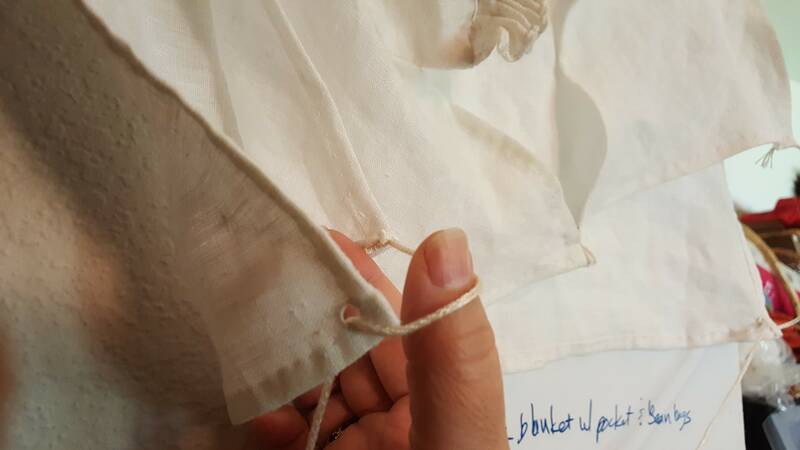 Blue marks are a fabric pen. They will wash out. I started with two pieces of fabric 40″w x 60″t. I’ve whacked a hunk out of the fabric at the shoulders..(3.5″ x 10″) so the neck should have a tendency to stand up. As an added bonus I won’t have that weirdness that comes when trying to make even gather stitches that transition from the front of the shirt to the back of the shirt and have to stretch over the shoulder seam. I plan to do a small flat-fold hem along the outside of the collar and the top of the shoulders and then I’ll pleat around the outside of the up-standing neck and smock that into the honey comb pattern. Once the honeycomb is done I plan to add a strip of fabric to the inside of the neck to cover the pleats on the inside and to make the shirt more comfortable to wear. I’ve set aside some 2.8 oz linen I acquired online. I’m afraid 2.8 oz may be too fragile.. but I’ll make the shirt up anyway and see how it survives. The linen is very very fine. The honeycomb pleat should draw in the neckline by ~50%. So I’ve actually left 2x my neck measurement at the top of the garment to be pleated. 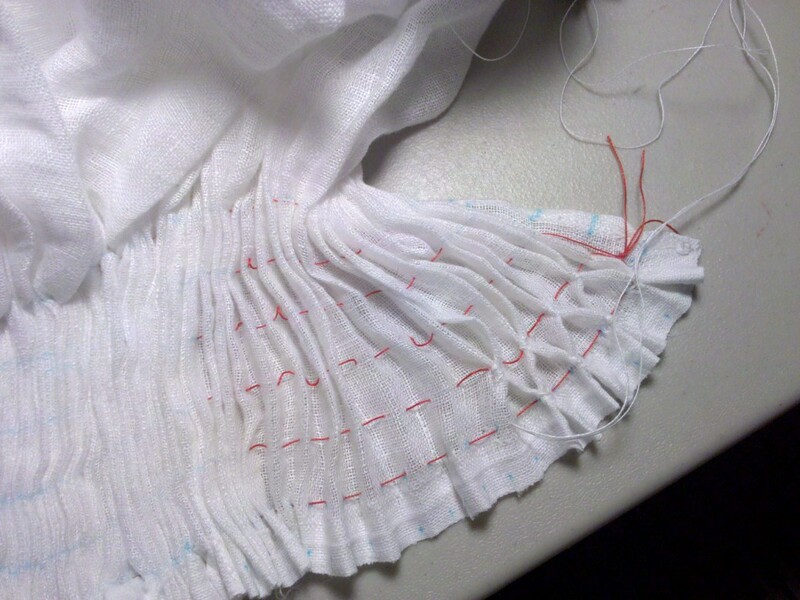 A while back Cristina Stolte posted a smocking experiment. Using her work I’ve decided to make my gather stitches at 1cm each and each line is 1.5 cm apart. The honeycomb pleat stitches will follow the same line at the gather stitches. This should give me a very nice set of diamonds for the neck line. When is a hood not a hood? When it’s a bonnet and frontlet.. unless it isn’t.